Royal College of Art graduate Jun Kamei has built a garment that functions like gills, which could allow humans to survive when sea levels rise up and submerge the earth. 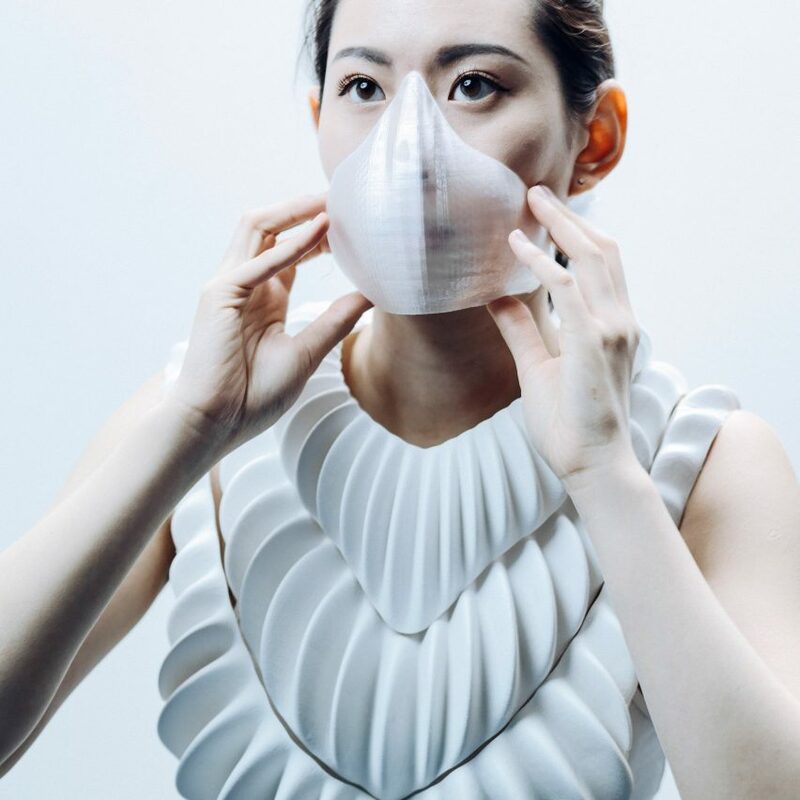 Called Amphibio, the two-part 3D-printed accessory consists of a gill and a respiratory mask. 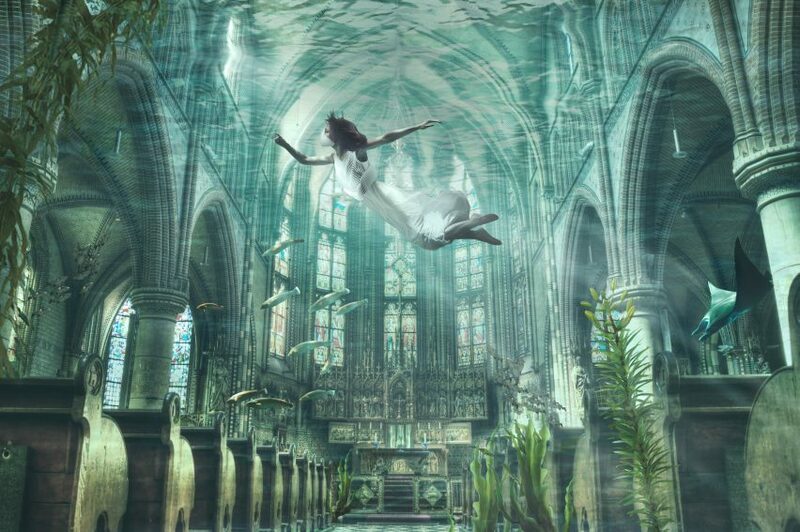 It is designed to allow humans to completely breathe underwater. Kamei has built a working prototype of Amphibio. Although it currently doesn’t produce enough oxygen to sustain human breathing, it is able to successfully extract oxygen from water, and release carbon dioxide back in – meaning it has the potential to be used for breathing. The RCA graduate imagines it becoming an essential part of living in the future, when the ocean rises up and claims the majority of the earth’s land, and humans are forced to spend much of their lives in the water. “By 2100, a temperature rise of 3.2 degrees celsius is predicted to happen, causing a sea-level rise affecting between 500 million and three billion people, and submerging the megacities situated in the coastal areas,” he explained. 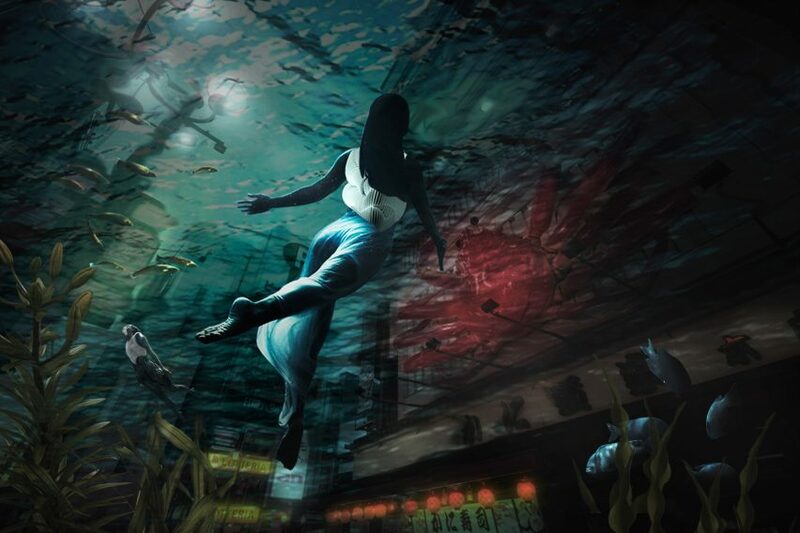 Rather than focus on the negative, dystopian idea of a “flooded world”, Kamei’s proposal is intended to offer a comforting and optimistic vision of the future, where humans are free to live in the oceans as well as on land. He describes it as a place where humans can enjoy “a peaceful touristic dive in the neighbouring church, or a night dive in the vivid streets”. A white device that is positioned around the neck and chest functions as the gill. It is hollow inside and contains air, which can be breathed in and out via the mask, connected to the gill by a tube. 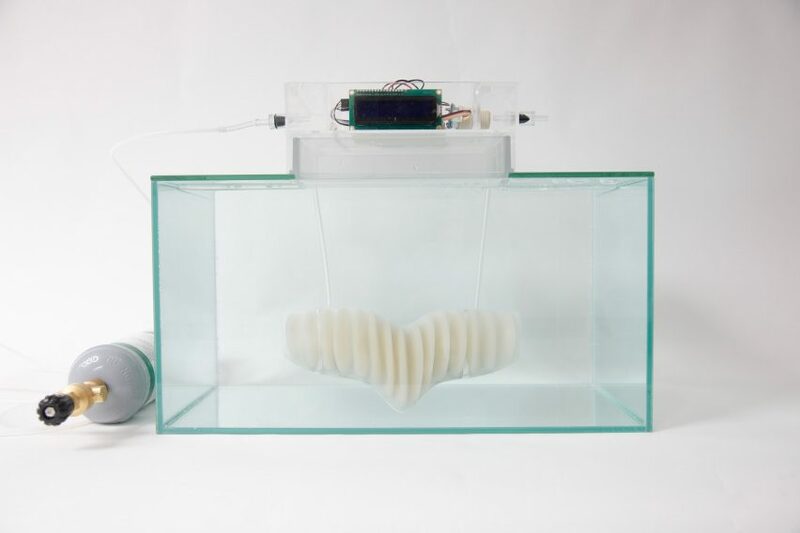 The gill accessory is 3D-printed from a microporous hydrophobic material, which supports subaquatic breathing by extracting oxygen from the surrounding water and dissipating the carbon dioxide that accumulates in the system. The microscopic pores in the material allow air to pass through, but stop any water from penetrating it. The technology was inspired by water-diving insects that survive underwater by way of a thin layer of trapped air on the surface of their superhydrophobic skin, which functions in the same manner as a gas-exchanging gill. Kamei developed a custom 3D-printing filament to produce this material. 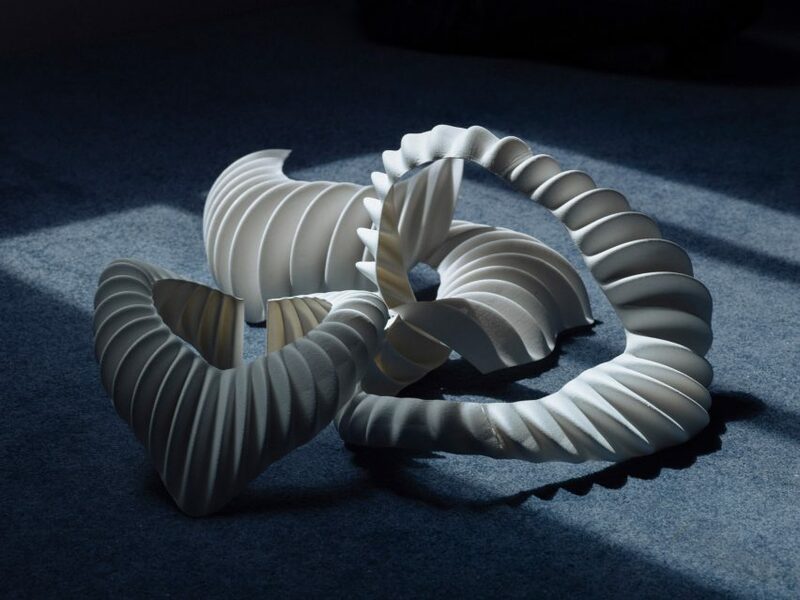 The designer suggested that, as 3D-printing technologies become more readily accessible, people could buy this filament and use to print garments that are uniquely tailored to their own body shape. The project was developed within the RCA-IIS Tokyo Design Lab – an experimental design technology studio set up through a partnership between the RCA and the University of Tokyo. Although the current prototype is not developed enough to fully support human breathing on its own, it can function when supplemented by a small gas tank. “If you are familiar with free diving and scuba diving equipment, Amphibio sits right in between those two,” explained Kamei. “In the near future, it could allow the wearer to stay underwater longer than in free diving, but with less equipment – such as a smaller gas tank – than used in scuba diving,” he continued. The designer’s next step is to develop the device so that it can be tested on humans. It would require a gill of at least 32 square metres to support human oxygen consumption in water. This year’s RCA graduate show also saw product design student Marcus Kung unveil a propellerless drone, and architecture student Devan Skuban design a Brexit-themed museum to explore the impact of Britain’s departure from the European Union.